Payments as low as $318/mo. Or, apply & pay as little as $318/mo. Tight and Bright! A shimmery offering from the crew at McPherson. Sparkles and shines throughout it's range, with a balanced volume that's sure to impress! 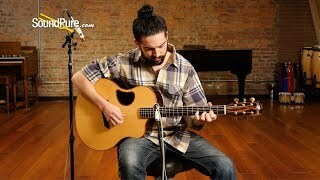 In this video, Sound Pure guitar specialist Michael Buckley tests and reviews the gorgeous McPherson MG 3.5 Engelmann Spruce/Macassar Ebony acoustic guitar. More than three decades ago, McPherson revolutionized the acoustic guitar world by introducing a unique Offset Soundhole Technology. This breakthrough design increased the total flexible surface area on the central part of the instrument. Since then, we have continued to be a pioneer in the marketplace with our state-of-the-art bracing, cantilivered neck, and soundhole design. When asked the question, “Why do you play a McPherson guitar?”, some might answer it’s the superior craftsmanship or the stability of the neck. Some might say it’s the innovative design or the inspiration it brings to the performer. But without a doubt they will all agree it’s the sound of the McPherson guitar that sets it apart from the crowd. The rich, full tone and clarity of the McPherson guitar is like no other. Once you pick one up, you will never want to put it down. The acoustic guitar is an instrument with a lot of history. Some of the most incredible acoustic instruments were made in America during what is known as the “Golden Era” of guitar building, but not much has changed since. Many boutique builders pride themselves on making the most faithful recreations of these aging instruments, and most of the focus is placed on looking into the past. McPherson Guitars is not one of these brands. Believing that there is more to strive for out of flat-top acoustics, McPherson introduced their revolutionary Offset Soundhole Technology over three decades ago. This allows for greater vibration in the center of the guitar top, as well as more volume and clarity in the ears of the player. Their unique bracing system also creates a larger, more even space for the top to vibrate, increasing the clarity and projection of sound. Every McPherson guitar features a cantilevered neck, which means that the fretboard does not actually make contact with the guitar top. This design allows the space underneath the fretboard to vibrate, again contributing to a larger area of flexible surface on the top. McPherson guitars also offer an enormous selection of tonewoods, from the classic Spruce, Rosewood, and Mahogany varieties to the rare and exotic. Some of the less common tonewoods like Acacia, Cocobolo, Walnut, Pau Rosa, Macassar Ebony, and others can be combined in interested ways to make very unique sounding instruments. While many of the advancements McPherson has made in acoustic guitar building result in superior tone, sustain, and resonance, McPhersons are also far less susceptible to damage than their “Golden Era” counterparts. Every McPherson neck is fitted with a carbon graphite truss rod in a triangulated system that is so stable that it eliminates the need for neck adjustment. If you are looking for an acoustic guitar that is more than just a replica, look no further than McPherson Guitars. In 50 years, they might be the ones being replicated. 12th Fret Width: 2 5/32"